We’ve talked about cameos a few times on here before. Cameos by celebrity fans are fairly common, and scientists are a great choice when you’re looking to lend your sci-fi some scientific credibility. However, there’s also the other side of the coin–when sci-fi characters drop out of their own universes and make cameos in shows where they wouldn’t usually belong. This isn’t just using the actor or referencing their famous role; we’ve actually got a pseudo-crossover on our hands. 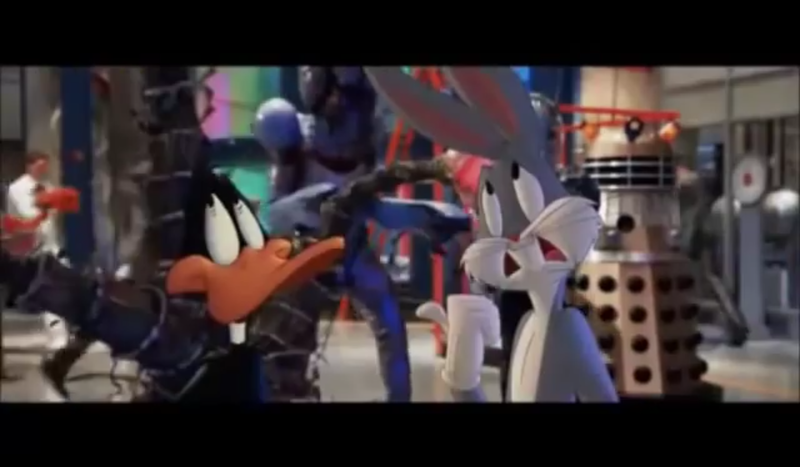 (The big difference between these cameos and crossovers is that these aren’t canon to their sci-fi origins.) Who does that? Let’s find out! 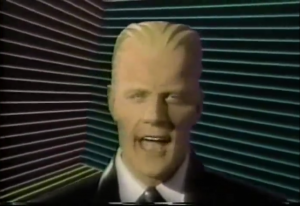 Max Headroom originates from a cyberpunk series in the 80’s, but he kinda took on a life of his own outside the show. We’re gonna talk a lot about him this month so I’ll save the details for later. The glitchy AI character even managed to make an appearance on, of all things, Sesame Street. Max’s job is to say the alphabet, which seems like a terrible choice for someone whose most identifying characteristic is stuttering, skipping speech. 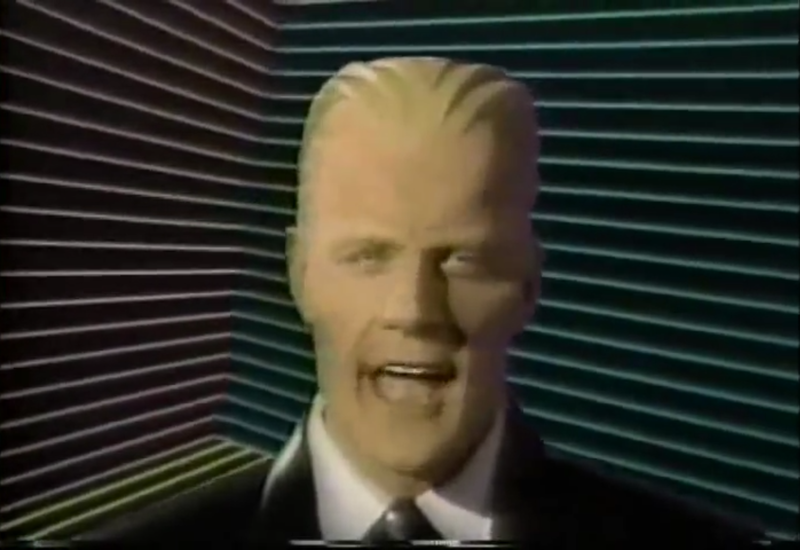 Still, Max manages to make it through the alphabet without even a single stutter (he barely avoids one at J), although he does insert some silly comments about a few letters like M. I don’t know that the full clip with context exists, but if for some reason you’ve just always wanted to hear Max Headroom say letters, you can do that here. 3. The Observers Among Us–Reality? Don’t worry, most of us are just as bored by baseball. This is definitely a weird one. 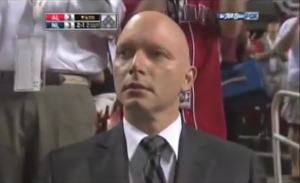 As part of the promotion for Fringe during its first season, the Observers began to appear all over the place. I guess Fox figures its sci-fi shows are doomed anyways, so why not experiment with them a little? This was intended as a really odd form of viral marketing; people spot an Observer in the crowd of, say, American Idol, and then go online to talk about it and see if anyone else spotted that. It reached a ton of different things, including MLB games, NASCAR, the NFL, even off Fox Network like in the crowd of the Today Show. All those videos are edited the same way, if you hadn’t noticed, so were likely uploaded by Fox directly to make sure everyone who cares caught it or had something to point to in order to prove it really happened. Mulder and Scully in yellow Simpsons form, if ever you wanted that. The X-Files and The Simpsons were two of the shows that helped to put Fox on the map as a legitimate competitor to the other three networks. So, why not combine them? Fox likes to cross-promote, if you can’t tell. 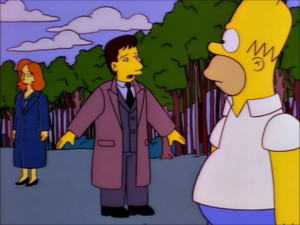 It goes down basically how you’d expect: Homer sees something weird that sparks Mulder’s interest enough to bring the duo to Springfield, and the rest of the episode is dedicated to lampooning some of the common tropes of the series. Obviously, since it’s animated, it doesn’t count as part of The X-Files continuity, so the whole thing’s really just for a laugh. As a bonus, the episode also features Leonard Nemoy as himself, plus a quick cameo of Chewbacca, Alf, Gort (from The Day The Earth Stood Still), and Marvin the Martian in an alien lineup. 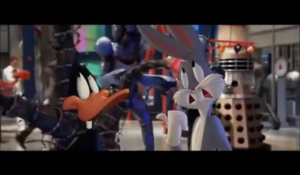 Speaking of Marvin the Martian, he’s got another scene on this list. 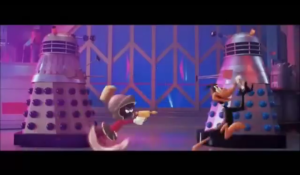 In the not-terribly-good movie Looney Tunes: Back in Action, the characters end up at Area 52, which is even more secret than area 51. And at Area 52 are a number of alien creatures from throughout movie history, among them a couple of Daleks. The Daleks were included at the behest of Steve Martin, who felt they deserved a spot… except no one thought to clear the rights on that one, and Warner Brothers was in hot water with the Terry Nation estate for a while as a result. The scene itself is pretty short, but the Daleks do get to exterminate someone (Marvin, actually) and are just generally given a bit more dignity than their fellow aliens. Any other weird cameos of sci-fi characters outside their element that you can think of? Let me know in the comments, or on Twitter @RetroPhaseShift. And if you enjoyed the article, please share it!